Effective environmental energy management can reduce your carbon footprint and lead to cost savings for your business. Green Spark can provide managed solutions tailored to your specific business needs to monitor and reduce energy consumption and ensure you become more energy efficient. Effective environmental energy management can reduce your carbon footprint and lead to cost savings for your business. Green Spark can provide managed solutions tailored to your specific business needs to reduce energy consumption and ensure you become more energy efficient. Why not take a look at our knowledge bank where you will find our relevant brochures, how to guides and fact sheets. We provide a variety of specific business energy management solutions to improve your efficiency. This includes implementation of real-time environmental energy management systems so you can track and identify areas of improvement. We also provide training and low cost solutions through waste elmination and process efficiency. Green Spark offers energy efficiency solutions and provides an energy management system that can be integrated into your business to monitor energy consumption and determine areas for improvement. We can also provide hardware and software required to ensure accurate monitoring. Real-time energy consumption data can support financial savings and a reduction in emissions and your carbon footprint. Effective environmental energy management can reduce your carbon footprint and lead to cost savings for your business. Environmental site assessments can assist your business in managing your environmental risks. We can provide support, advise and quick emergency response to help you reduce the environmental impact of emergencies. 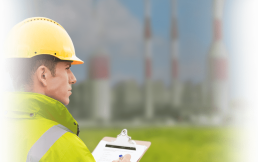 Get in touch with Green Spark today and see how we can help you with pollution risk management, environmental services and fuel quality management. I Have ISO 14001:2004, What Do I Need To Do?